RIVERSIDE, Calif. (www.ucr.edu) — Distinguished Professor of Chemistry Christopher Reed has earned this year’s Richard C. Tolman Medal for his outstanding contributions to chemistry. There will be a dinner and award ceremony on the UCR campus Wednesday, April 20 to celebrate Reed’s accomplishments. The Richard C. Tolman Medal is awarded each year by the Southern California Section of the American Chemical Society in recognition of outstanding contributions to chemistry. The list of previous award winners includes six Nobel laureates. Richard C. Tolman was a physical chemist and physicist who demonstrated the electron to be the charge-carrying particle in the flow of electricity in metals and determined its mass. Tolman became professor and dean of graduate studies at Pasadena’s California Institute of Technology (1922-1948). Professor Reed’s achievements have been in basic research. He specializes in making molecules that haven't been made before. In 30 years of research carried out in Southern California, he has “shown extraordinary creativity and had an unusually broad impact across both organic and inorganic chemistry” says his colleague Mike Rettig who nominated Reed for the award. One of Reed’s biggest contributions is in the field of superacids, a field that has had tremendous influence on academic and industrial chemistry. Superacids are acids (sources of positive hydrogen ions) stronger than 100 percent sulfuric acid. “Strength” here means the ability to transfer hydrogen ions and influence chemical change in substances that are normally non reactive to weaker acids. Reed’s research group has prepared a new class of superacids called carborane acids. In a paper published in the Oct. 11 2004 issue of “Angewandte Chemie” titled The Strongest Isolable Acid co-authored with UCR students Mark Juhasz, Stephan Hoffmann and Kee-Chan Kim, and Dr. Evgenii Stoyanov of the Boreskov Institute of Catalysis in Novosibirsk, Russia, the group showed that carborane acids are the strongest pure acids presently known. Remarkably, they are also the gentlest acids presently known. They allow chemists to add acid to fragile molecules that previously decomposed in acid. There are potential applications in the petroleum and pharmaceutical industries where acid-catalyzed reactions are critically important. Professor Reed was born in New Zealand and began research in 1968 at the University of Auckland, New Zealand, where he earned his B.S. and his Ph.D. in Chemistry. He then went on to Stanford University for postdoctoral studies and began his independent research career at the University of Southern California in 1973. 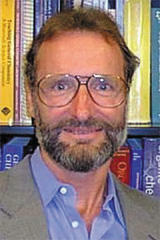 In 1998 he moved to UC Riverside to help build the Department of Chemistry into a nationally ranked research department. Previous recognition of his research has come by way of awards from the Alfred P. Sloan, Camille and Henry Dreyfus, Simon Guggenheim and Alexander von Humboldt foundations.